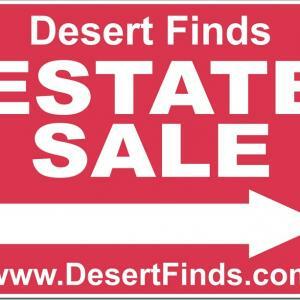 Desert Finds specializes in on site Estate Sales. We extend all of our experience to get the best price for your items. Before you start to do a loved ones estate please call so you do not have to do the work yourself. Remember just remove personal items and let us do the rest. Do not throw a thing away until you meet with someone from Desert Finds. We also do Sales for different situations, Court ordered, Attorneys, Realtors, Death, Divorce, Foreclosures, Moving, Downsizing, Get the most value you can before you donate your items.